After last weeks impressive win by the Wolues over third place Islanders, the team seemed to have returned to the A.O. Shirley Grounds the following weekend in the same mode and playing with the same level of intensity. In fact it only took Simon Cross just eighteen minutes to find the back of the net to take a one nil lead over the Rebels F.C. A few minutes later it was the aggressive number 10 Jamie Wilson following on from last weeks goal, who took the game away from the bad boy Rebels with two back to back goals in the 20th and 21st minutes and make the score 3 nil. Exactly 10 minutes later Simon Cross returns again to make the score four nil and the goal that would secure the victory for Wolues F.C. The Rebels didn’t give up and were able to score two quick goals early in the second half first by Theodore Brooks and five minutes later Joel Williams number 16 made the score 4-2 in favour of Wolues. There were to be no further goals scored in the second half by either team and Wolues retained their 4-2 advantage to take the win!! A large crowd were in attendance to see their younger team VG United come up against the experienced Old Madrid. The home side celebrated when the number 3 Devante Samuels scored in the 07th minute of the game, but Brandon Sylvester equalized for Old Madrid in the 23rd minute of play. VG’s hopes were lifted when Aljieoun Mingo scored two minutes later in the 25th minute, but Old Madrid followed with two quick goals in the 30th and 34th minute to make the score 3-2 at the half, with goals by number 10 Kenmore Peters and number 16 Rohan Sweeney. The second half was very much dominated by the more experienced Old Madrid side who never really allowed VG United much possession of the ball in the second half. Old Madrid scored two more times with number 13 Nicholas Hall scoring in the 63rd minute and number 18 Xavier John scoring in the 79th minute of play for a final 5-2 victory for the visitors. In the final game of the weekend third placed Islanders F.C came up against 4th placed Panthers F.C in a game which was expected to be tough as Islanders are still in striking distance of a title shot. There was a big turnout of Sugar Boys spectators who came to support Panthers hoping they could steal a point and keep the Islanders away from their second placed Sugar Boys, giving them an open shot at the big head to head game next week at the A.O. Shirley Grounds between Sugar Boys and One Love F.C. With the game being focused mainly on two good defensive teams, nothing much happened in the first half which ended with no goals being scored. In the second half the experience of Islanders began to show up as they had multiple attempts at goal. Unfortunately for them Panthers have recently picked up a young goal keeper named Philip Jules who came out of the BDO Schools league program and has now progressed to being the National Team goalkeeper. Jules kept Islanders at bay with three impressive saves. It was definitely the night of the youth as another young player, who also came out of the BDO schools program, Sheldon Harry took a corner kick in the 77th minute of play which was placed well enough to create an error by the Panthers F.C and find the boot one of BVI’s most experienced strikers Rohan “Chi Chi” Lennon. 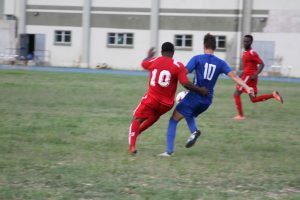 Lennon made no mistake and put the ball in the back of the net for a final score of 1-0 to the Islanders F.C and leaving Islanders keen to see the outcome of next Saturdays matchup between One Love F.C and Sugar Boys at the A. O. Shirley Grounds.